The Illustrator’s Notetaking Bible combines two hot trends: Bible journaling and adult coloring. Through unique illustrations included on every page spread, readers, illustrator’s, and notetakers alike learn to engage the biblical text in a new way. The exceptional design offers a unique balance for everyone from seasoned artists to the creatively challenged, allowing for guided creativity and meaningful personalization of the Bible reading experience. From filigree, Scripture quotes, and unique images, these line-drawn illustrations are waiting to be brought to life. 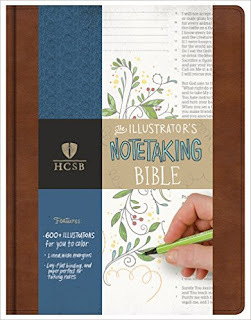 HCSB Illustrator's Notetaking Bible is an incredible Bible! This is definitely one of my favorite Bibles. I love that you can take notes on the side and color in the images to add a little color to your Bible. HCSB Illustrator's Notetaking Bible also has a wonderful leather cover to protect it so your sure to get years and years of use from it. With over 600 images throughout this HCSB Illustrator's Notetaking Bible you're sure to spend more time in God's Word! Adult coloring is everywhere right now and I'm so thrilled to see it incorporated in this HCSB Illustrator's Notetaking Bible! I highly recommend this HCSB Illustrator's Notetaking Bible! You can find HCSB Illustrator's Notetaking Bible on Amazon, Barnes and Noble and other bookstores.